Between the Grammys and New York Fashion Week, the reality star sightings are in overdrive this weekend! Stassi Schroeder and Dorinda Medley took in a few of the NYFW shows this weekend, as did Kristen Taekman, Luann de Lesseps & new hubby Tom D’Agostino, and Phaedra Parks. Over on the West Coast, the celebrities were flocking to Grammy parties. Tamar Braxton, Kris Jenner, Kourtney Kardashian, Erika Jayne, Kandi Burruss and many more were photographed at the main event and the pre-party celebrations. Also in our reality star photo roundup: Snooki, Tom Sandoval & Ariana Madix, Eden Sassoon, and more! Check them all out below. Who do you think is best dressed? The ladies of The Real Housewives of Beverly Hills turned out to support Lisa Rinna as she was honored at the Project Angel Food’s Angel Awards 2016. Camille Grammer, Kyle Richards, and newbie Eden Sassoon were among those spotted at the event. Real Housewives of New Jersey stars Jacqueline and Chris Laurita were also photographed in attendance. 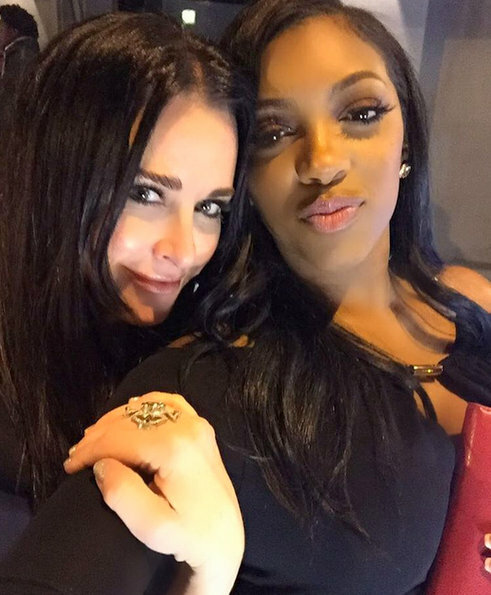 Other reality stars were out and about over the weekend, celebrating pre-Emmy parties and attend the awards show last night: Claudia Jordan, Porsha Williams, and others. NeNe Leakes was also over on the West Coast to attend the 5th Annual Women Making History brunch. The Kardashians invaded Miami this week with Kim forgetting most of her outfit at the hotel. Also seen out and about: Bella Hadid, Kim Zolciak, Rachel Zoe and more. Check out all of the photos below!